Reply: Hi Barnaby, I’ve yet to see an electronic device tell the difference between beneficial mosquitoes (our allies) and the pest species. No device is more effective than physical exclusion. And no response is better than adapting your household to living with mosquitoes in the subtropics. I had to do this when I moved here from Sydney in 2003. I have identified six species of mosquito at Bellis, my home and garden. One of them is the Predatory Mosquito (Toxorhynchites speciosus), a biocontrol. Its larvae are big and they specialise in eating parasitic mosquito larvae (the ones that spread disease). Toxorhynchites breeds in the water-filled trough where I grow my Pitcher plants (Nepenthes spp. 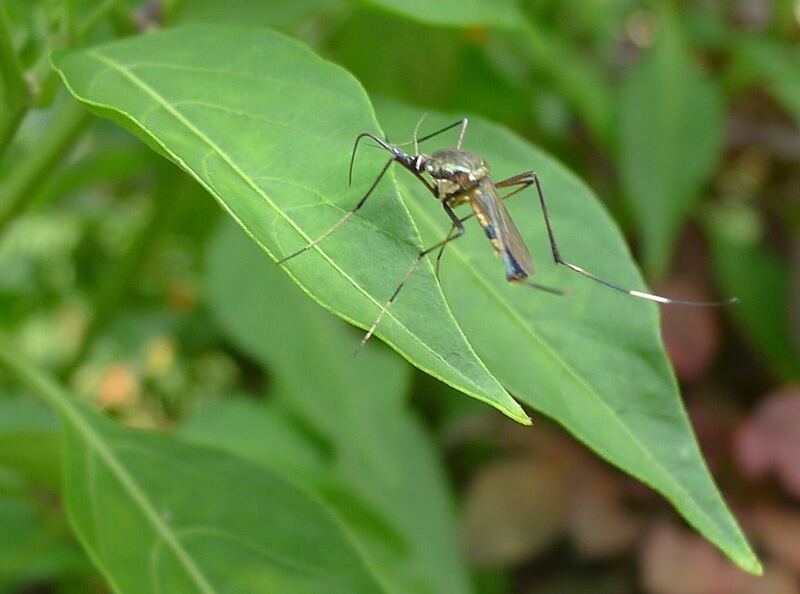 ), and they have been preventing parasitic, blood sucking mosquito species from breeding in my garden for years. This biocontrol is active from spring to autumn. Adult Toxorhynchites drink nectar, not blood. They are gentle giants, much bigger than the average mosquito. They’re also noisier and fly more slowly. Often you hear them before you see them. Toxorhynchites has been providing my property with its ecological service for several years. I have trained housemates and visitors to recognise and respect this beneficial creature. I’ve posted many times on my public Facebook page about the use of biocontrols, including this one. Web-weaving spiders are the best mosquito biocontrol. You can observe how lethal they are in mangroves, their webs strain clouds of mosquitoes out of the air. Yet just a short walk away – where mangroves have been cut down, eliminating spider habitat – and you’ll be eaten alive by mosquitoes. Electronic mosquito killers cannot detect the difference between beneficial and parasitic mosquito species – like the Predatory Mosquito can. Some electronic devices destroy other valuable biocontrols – like praying mantis, the biocontrols of grasshoppers – and pointlessly massacre harmless winged insect species like moths. I will not have these clumsy contrivances in my home. Brisbane City Council sprays mosquitoes with a growth regulator, preventing larvae becoming sexually active adults. This chemical significantly reduces seasonal populations of all mosquito species. Simple, good housekeeping in the home and garden dramatically reduce mosquito popluations and problems: gutters that drain, empty pot plant saucers (or fill saucers with sand), keep fish in ornamental pools (I keep Pacific Blue Eye fish), remove fallen palm fronds (which hold water), fit flyscreen to windows, and shut doors. If you have plants that must be kept damp at all times, have a look at how you can make your own self-watering containers (almost free). I keep only a few water-holding bromeliads since they are a magnet for mosquitoes. Instead I grow terrestrial bromeliads – pineapples (Ananas spp. ), Cryptanthus, Dyckia, Puya and Tillandsia. These do not collect water or attract mosquitoes. I keep Nepenthes in a styrofoam trough which is a quarter filled filled with water at all times. This is where my Predatory mosquitoes are free to breed. Make sure your rainwater tank and drains are mosquito-proof. My stormwater infiltration well in the front garden gathers stormwater, allowing it to passively water my front garden faster than mosquito larvae can mature. My rain harvesting home and garden was featured as ‘best practice’ by the Sendzimir Foundation (in Poland) in the latest ‘Guideline for Decisionmakers: Water in the City, Sustainable Development‘ at the European Regional Centre for Ecohydrology, under the auspices of UNESCO. I apply all the above strategies. Of course there are bursts of mosquitoes, each species breeds in response to the season and weather events, but these bursts pass in a matter of days. I wear appropriate clothing when gardening, I use mosquito repellent, and I keep fly swats in strategic places indoors. A flowering Utricularia growing amongst waterlilies. I acquired a species of Utricularia from Suncoast Water Gardens. Utricularia is a free-floating aquatic insectivorous plant with filamentous growth and cute bright yellow flowers in the warm seasons. It feeds on mosquito larvae. Provide a bright position for it to flourish. You can divide plants in late spring and through summer. The down side of this plant is that it doesn’t discriminate between the predatory and blood-sucking species of mosquito larvae. You can take the fight to mosquitoes by using this trap which employs mosquito breeding behaviour against them. To work this requires a minimum of three traps per hectare – no chemicals are needed. Get your neighbours involved. I wish I had known earlier about those big old ‘skeetas being ‘good guys’. I have a few apologies to make next time I spot one. There’s so much to learn that life seems far too short sometimes. Any rate a terrific lot of good ideas there Jerry – something to be going on with I’d say. I have also had good success with keeping all sorts of unwanted critters out of my commercially acquired water reservoir troughs. I find the smaller version of these are more manageable for me than the larger ones or even the styro foam boxes which once full of mix are surprisingly hefty. But I digress. I keep a rolled up piece of plastic onion/orange bag tucked in the overflow hole. One bag, once snipped up, is enough for two or three pots though I suspect scraps of shade cloth or even scraps of tulle would do as well just as long as the fabric is open enough to not impede the flow of water too much. I have found the plastic mesh lets water drain out and keeps mozzies and young toads out at the same time. They do need to be pulled out regularly and cleaned as they get clogged up if left for too long but a quick swoosh in a bucket or rinse under the hose and back they go. As you say Jerry, a physical barrier is often the simplest and best solution. Than you for such an informative article. We moved to a house and 3 acres where it had been fumigated and sprayed and every bug within cooee had been killed. I refuse to use sprays etc. It was terrible. First we had a plague of cockroaches Then came the grey huntsman spiders. Then the ants. The midges and mosquitoes almost drove us crazy. Finally the web building spiders returned and the mossies reduced. It was a couple of years before we started to see frogs and lizards returning and then the micro bats came back. Now 7 years down the track. We don’t need any man made repellants etc. The balance is back. We do have mossies etc. but not in plagues like before. And now we get to enjoy the solitary bees and wasps and beautiful butterflies that were missing when we first came here. Great article Jerry. I agree with your bug zapper thoughts, in addition to that bug zappers and other mosquito traps attract mosquitoes to them (that is how they work), so by using them people could be attracting more mosquitoes into their yard than they had in the first place. In regard to clothing light coloured clothing is less attractive to mosquitoes. Thank you Jerry for this really useful post about Australian mosquito populations. I remember those big mosquitoes from my acreage property on the Gold Coast. Did not realise how helpful they are. On the Gold Coast could not remain outside after dusk, and midges made gardening very unpleasant after rain. Now I am into my third year in Brisbane initially seemed far less mozzies than Gold Coast but this year I have definitely noticed them more as well as midges. In Newcastle NSW, we have a mossie called the Hexham Grey. Since childhood this mosquito has been recognised as a friend and is immortalised on a local club signage. It’s a lanky, slow beastie who spends most of its time in and around our area near Hexham. Aedes alternans has predatory larvae. Adults are parasitic. But Newcastle is not in the subtropics, it is warm temperate.